On November 1, View Ridge Middle School eighth graders had a unique opportunity to plan their future. 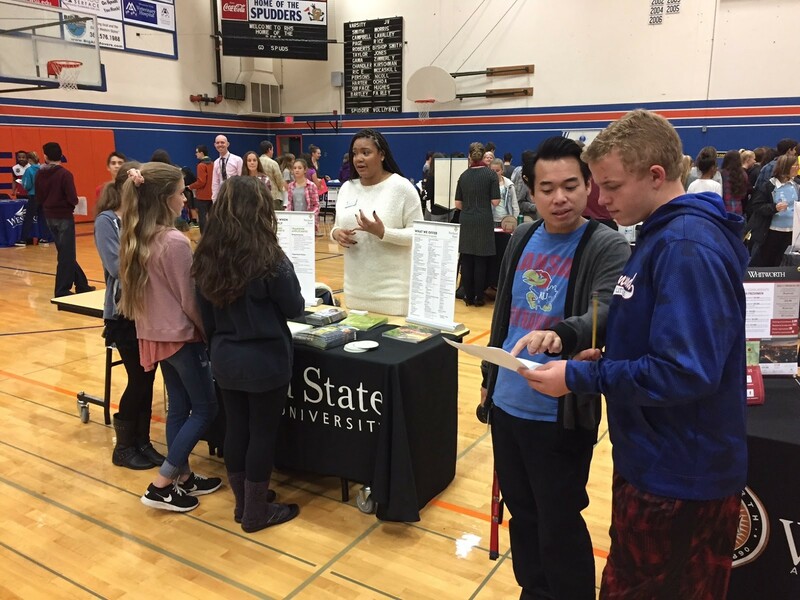 They attended Ridgefield High School’s annual Fall College Fair—an event that was previously open only to high school students. Eighth graders were first invited to the event last year by Ridgefield High School Counselors, Ray Lions and Monica DeShazer, and High School and Beyond Coordinator, Amy McKenna. The fair sparked so much interest and discussion at the middle school that the event is now open to eighth graders as well. The Fall College Fair provides an opportunity for the middle schoolers to visit with representatives from a wide range of post-high school options that include two- and four-year colleges, trade schools, apprenticeship programs, and branches of the military. The students are encouraged to speak with at least one representative from each area to inquire about entrance requirements, training programs, student life and a variety of other topics of interest to them. “It is well understood that adolescents start forming their ideas about what they will do after high school well before going to high school,” said View Ridge Middle School Principal Tony Smith. He added that his staff works with View Ridge Middle School Counselor, Kirstin Kunihisa, to learn how to better inform students of the possibilities that lie ahead of them. “We know if students can better connect their current learning to a compelling future, they will be more interested and motivated,” said Smith. Eighth grader, Khoi Dawkins, attended the college fair with a clear focus in mind. “I’d like to play lacrosse in college, and there aren’t very many schools on the west coast that have lacrosse,” he said. He inquired about pre-law programs and had in-depth discussions with representatives from Pacific Lutheran University and Portland State University. 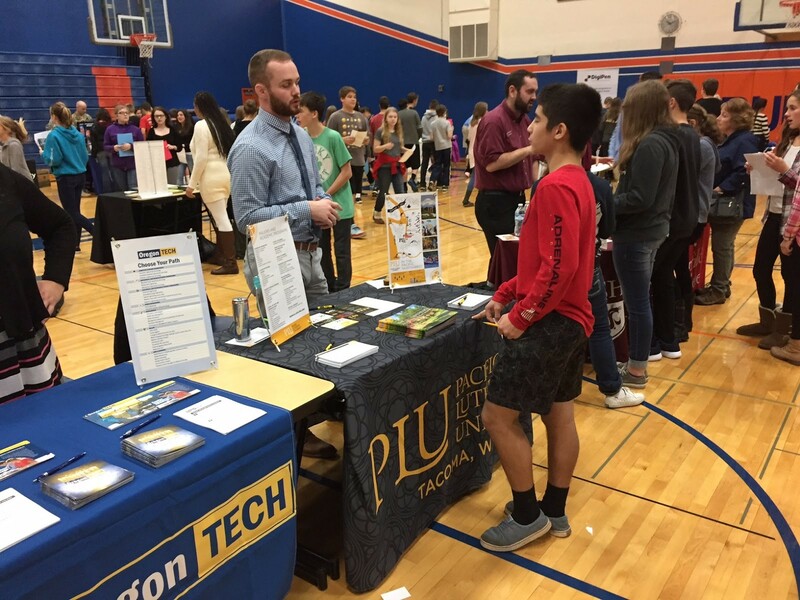 He was pleased with the options the fair provided, but thinks he may want to look beyond the Pacific Northwest for programs that meet his post-high school expectations. Sheryl Willis was at the fair to learn more about getting into a job quickly. “I’m looking for photography-type jobs, and a lot of community colleges have programs where you finish and go right into a job,” said the eighth grader, adding “I don’t want to go to years and years of school before I’m doing something to make money.” She was particularly impressed with Mt. Hood Community College but was also intrigued by a four-year program at the University of Washington. At Ridgefield High School, all students are required to prepare a “High School and Beyond Plan,” in which they investigate their career interests and the requisite training associated with them. Smith plans to implement the same requirement at the middle school level for his students.